The Milwaukee Bucks Malcolm Brogdon on Monday night became the 68th player to receive the NBA’s Rookie of the Year honors. A second-round choice of the Bucks out of the University of Virginia, Brogdon became the first second round pick to win the award in the league’s history. Here are 10 stats you may not know about Brogdon winning the ROY honor. Brogdon averaged 26.4 minutes in his first season in the NBA. It is the fewest average minutes played in a season by any ROY in league history. Only three players who won the ROY averaged less than 30 minutes played per game in the season they won the award: Brogdon (26.4), Mike Miller (29.1 with Orlando in 2001) and Tommy Heinsohn (29.9 with Boston in 1957). Brogdon had a three-point shooting percentage of .404, which is the third highest of any ROY winner. The aforementioned Miller was at .407 his rookie season and Larry Bird shot .406 from the three-point arc his rookie campaign with the Celtics in 1980. Brogdon averaged 2.8 rebounds per game, the third lowest of any ROY award winner. Lowest: Phil Ford, 2.3 rebounds per game for the Kansas City Kings in 1979. Brogdon’s 4.2 assists per game puts him in a tie for 24th among the 68 ROY winners. His 1.1 steals per game places him tied for 23rd among the 68 ROY winners. Brogdon averaged 10.2 points per game. That is now the lowest PPG of any ROY recipient in NBA history. The previous low was 10.7 by Monk Meineke in 1953. Brogdon’s 10.2 PPG is only the ninth under 15 points per game of the ROY award winners. Brogdon’s .457 field goal percentage ranks 36th of the 68 ROY winners. Brogdon is only the second Bucks ROY in league history. Kareem Abdul-Jabbar (Lew Alcindor) won the award in 1970. 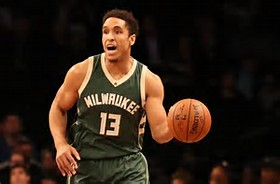 At age 24, Brogdon is one of only three players age 24 to win the NBA Rookie of the Year. David Robinson and Elgin Baylor were both 24 when they won the award. No one age 25 or older has ever won the league ROY. Since 2000, 11 of the 18 players who won the award were either age 19 or 20. Brogdon started 28 games for the Bucks this past season. It is the fewest games started by the eventual ROY winner since Vince Carter started 49 games in 1998-99.Bonus stat: Brogdon is only the fifth rookie in league history to play in 50 games his rookie season, and have a .450 field goal percentage, a .400 three-point field goal percentage, and .850 free throw percentage. The other rookies to accomplish this rare shooting trifecta were Steph Curry and Darren Collison in 2010, Anthony Morrow in 2009 and B.J. Armstrong in 1990.Bonus stat: Brogdon is only the fifth rookie in league history to play in 50 games his rookie season, and have a .450 field goal percentage, a .400 three-point field goal percentage, and .850 free throw percentage. The other rookies to accomplish this rare shooting trifecta were Steph Curry and Darren Collison in 2010, Anthony Morrow in 2009 and B.J. Armstrong in 1990.